Will Jean Valjean run for Congress? 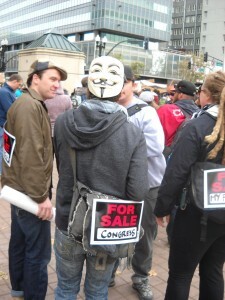 Protester in Oakland on Saturday. Protester in a one-sided debate Sunday. There were more Police than protesters and journalists on Sunday morning. 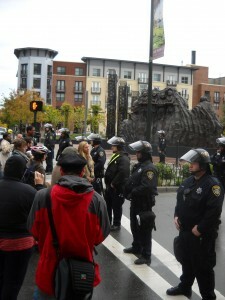 On Saturday afternoon of November 19, 2011, protesters gathered in Oakland. 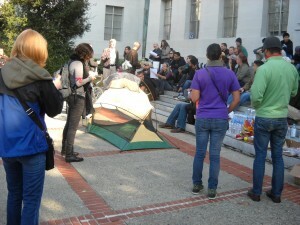 By Saturday night a new Occupy Oakland encampment had been set up at a different location. By 9 a.m. Sunday morning, it was gone. Just two months ago, Americans began assembling in Zuccotti Park in New York City to protest our lives being taken over by corrupt politicians who work for the Big Banks and Multinational Corporations instead of ‘We the People.’ Since then, the OWS Movement has spread like wildfire and has had enough influence to, among other things, change the media debate from cutting programs beneficial to the 99 Percent to discussing the obscene rewards the 1 Percent enjoys from gaming our system and bribery at the expense of the rest of us. If you can, try to show up for the protests that will be happening all over the nation, but especially in Zuccotti Park. For more info, go to Occupy Wall St.org. Poster copyright 2011 R Black. 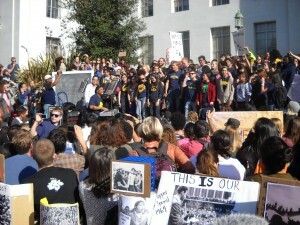 Striking students gather on Sproul Plaza Tuesday. 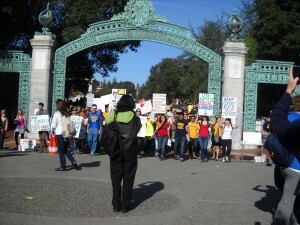 The fact that broadcast news media want to cover an issue in about 90 seconds works to the advantage of the Conservatives because most voters don’t want to get a complete picture of a complex issue and the student strike at University California Berkeley will provide an example of how the rush to oversimplify destroys journalism’s reason for being. In the Sixties the University system in California was an outstanding opportunity for young people in that state to acquire an affordable education. In the Seventies, Prop 13 was sold to home owning voters as a way to save money. The property tax had provided the funds for affordable educations. When Prop 13 passed, businesses saved large amounts of money when that tax was eliminated from their overhead expenses. Did they pass the savings along to consumers? Wealthy families are used to expecting that their kids will be college educated and become industry management. The potential for middle and low class families sending their children to college may have seemed like the underclasses were stealing opportunities for large salaries from them so it behooved the wealthy to put the cost of education beyond the capability of the middle and lower class. The fact that Prop 13 benefited business immensely made its passage a double payoff for the wealthy. Can an explanation of how the passage of Prop 13, more than 30 years ago, caused the current student unrest, be reduced to a few words that fit on a bumper sticker? Can the opposing force’s message of “Reduce taxes, increase jobs” be refuted on a bumper sticker? 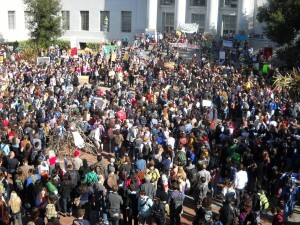 So today students strike to make the point that they want the opportunity for an affordable education just like there was in the Sixties and the people who don’t want to restart a tax burden they managed to eliminate just say “trickle down” and dupe the voters who don’t examine the history of an issue. 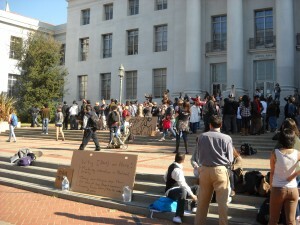 To the best of this photographer/columnist’s ability to cover the start of the UCB student strike on Tuesday, November 15, 2011, we can report that we did not see a single instance of any student burning his draft card. Doesn’t that prove conclusively that change has been delivered, just as promised? These tents were gone by Thursday morning. These steps are a famous protest site from the Sixties. This tent was taken down minutes later. The media (mostly) missed the incident that was part of protest history. On late Wednesday afternoon, events at UCB went to warp speed. Police moved in and arrests were made. Protesters assert that videos that showed Police brutality are available online. Things had calmed down by early evening. Some protesters asserted that the police were not wearing their badges during the arrests. Old Berkeley protesters might remember a time when a similar allegation resulted in a political cartoon in the Berkeley Barb that used a famous line from the movie “Treasure of the Sierra Madre” as a caption. 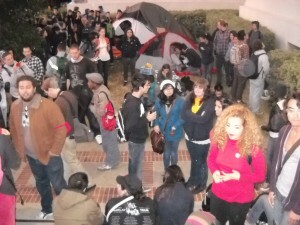 According to reports on KCBS news radio, tents were removed and more arrests were made about midnight. Thursday morning, things were calm again. 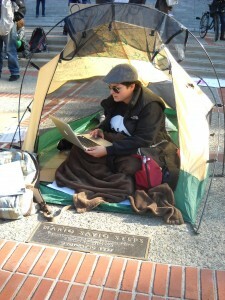 A tent was set up and occupied by Naomi SantaCruz close to the Mario Savio historic plaque. Students were told to move it. They complied. The tent was set up at the very edge of Keay Davidson’s class on the relationship between University of California and the nuclear weapons laboratory. 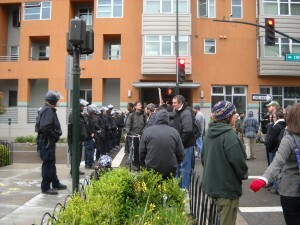 About 10:36 a.m. PST on Thursday, November 10, 2011, an incident occurred and a scuffle ensued. A protester was led away by officers. Students began to chant “Police brutality, police brutality” but the law enforcement officers chose to ignore the students’ suggestion. Could the tumult possibly have been much greater if the school had fired it’s football coach? “Over the last two and a half years I have watched with bemusement, I’ve been puzzled at the degree to which this thing just kept on going,” said the president. Project Vote Smart – H Amdt 92 Prohibiting the Use of Federal Funds for NASCAR Sponsorships Member Vote List. And the measure to prohibit the use of federal funds for Planned Parenthood passed. Of course. We can’t possibly fund a service for womens health that will end up saving money in the long run. But we sure as hell can afford to sponsor NASCAR. This, too, was never about the budget. Household Income Short of $68K? Welcome To the New Poverty. We are overdue for a class revolution. “Keith Olbermann, the liberal, outspoken anchor of MSNBC’s Countdown show, had his contract dramatically terminated by the US cable news network’s parent company NBC on Friday night. Although Comcast ferociously denies they had anything to do with this – and it is barely possible Keith simply refused to work for them and ended his contract by mutual agreement with MSNBC — the juxtaposition of FCC approval to take over NBC/Universal and Olbermann’s blink-quick departure reek with the stench of conservative mega-corporation Comcast sending a chilling message to the cable news network’s employees – especially air personalities Rachel Maddow, Ed Schultz and Lawrence O’Donnell – that if they go too ‘progressive’ in their shows, if they pull back the curtain on corporate malfeasance and corruption with too much zeal and fact, they could find their contracts suddenly cancelled as well. 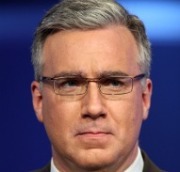 I’ve been a regular viewer and fan of Keith Olbermann’s since he first started Countdown eight years ago and I hope he shows up on the TV machine again soon; to paraphrase his sign-off, and mix in some Dylan Thomas, I wish him good luck, and I know he won’t go gently into that good night. The Memphis Commercial Appeal reports. “The thing we need to focus on about the Founders is that, given the social structure of their time, they were revolutionaries who brought liberty into a world where it hadn’t existed, to everybody — not all equally instantly — and it was their progress that we need to look at,” Rounds explained of his interpretation of the legacy of the Founding Fathers. The issue of revising curriculums to teach history in a manner that encourages the glossing over of the uglier factors of the past has popped up in other states over the past year. — AP, May 20, 2010. 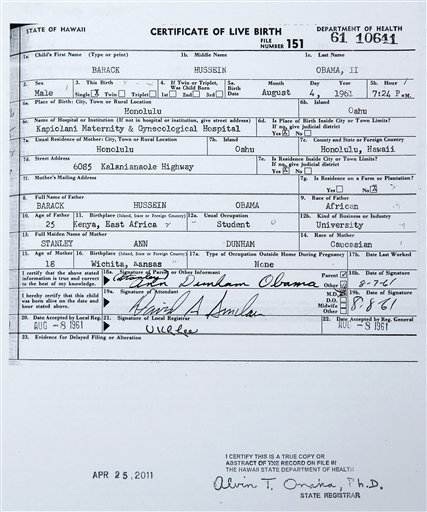 43 years after the assassination of Dr. Martin Luther King, can you believe this is going on? The Rachel Maddow Show – Breaking: Democrats might want to win. Both died Wednesday, Jan. 27th of natural causes, J.D. Salinger was 91; Howard Zinn was 87. Read more about Salinger here. Read more about Zinn here.